View Day 5's post HERE! This park's playlist can only be one track. Listen to it here. I have to preface this day's events, because a lot of you might be second-guessing my choices, and if you get what I was thinking, it might make it a little clearer for you. Starting on Thursday (Day 2) there were rumblings that a tropical storm was forming in the Gulf of Mexico and heading towards Florida. By Friday, it looked like that forecast was going to come true on Sunday night and into Monday. Monday was our only day at Disney's Hollywood Studios. 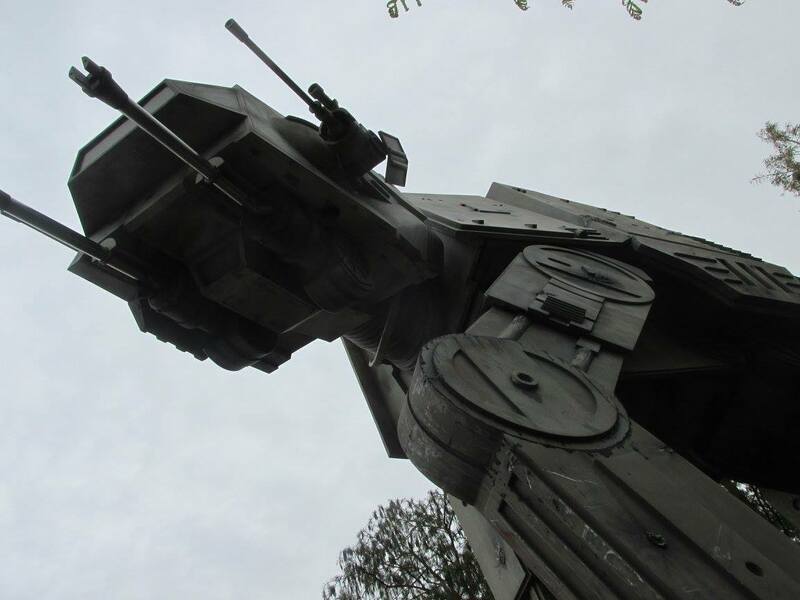 It is the smallest park of the four Disney parks, and about one-third of the park was closed back in April - including the Backlot Tour and the Animation Academy - to make way for more Star Wars content. However, it still had many great shows and attractions, including Toy Story Mania! However, if a tropical storm was coming through, that might derail our plans at the Studios since we did not have Park Hopper tickets and were only in the Studios for one day - our last day. So throughout Friday evening, Mom, Dad, and I were discussing a shuffling of our plans. Should we stick with our initial plan of Magic Kingdom on Saturday, Epcot on Sunday, and the Studios on Monday? Or should we do the Studios on Saturday instead? Several factors were in play. Firstly, we were doing Epcot and the Studios on Days 5 and 6 because of our hotel's close proximity to both parks. This would allow us to enjoy fast transportation without long waits. 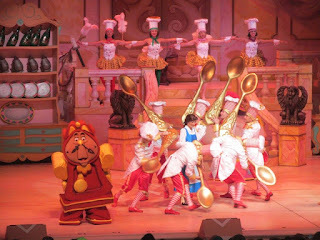 Secondly, we had made a very hard-to-get dinner reservation for Saturday at Be Our Guest in the Magic Kingdom. Thirdly, we had a very hard-to-get FastPass+ reservation for Soarin' at Epcot on Sunday! See the dilemma? It wasn't as easy as just switching a couple of days around. And while it was worth it overall to skip the Park Hopper option on our tickets, it kind of killed any plan modifications we would need to do in case of weather. In the end, my parents ended up loving both the Be Our Guest dinner and the second time on Soarin'. If we'd had any other dinner reservations or FastPass+ reservations, it would have been more likely that we would have made the switch in days. With that in mind, here we go for Day 6. After a couple of mornings of later-than-normal starts, we got up early to pack our bags and drive over to the Studios. It wasn't any problem getting there, but the parking lot is so different from the other three. There are multiple entrances, each manned by just a 2-car booth. Then all those cars entering from different areas have to merge all together to park! We ended up stuck behind a looooong line of cars coming from another direction after one of the cars in front of us misinterpreted the cast member's instructions and didn't turn when he was supposed to. As a result, we were parked way at the other end of the parking lot. We came prepared with sandals on our feet and ponchos in my drawstring bag, but we also put on sunscreen, because Florida. The park had just opened when we entered, and while nothing beats that first view down Main Street U.S.A. in the Magic Kingdom, I adore the view down Hollywood Boulevard - especially now that the Sorcerer Mickey hat has been removed and you can see the Chinese theater again! Our FastPass+ reservations were for Toy Story Mania, Star Tours, and the Tower of Terror. 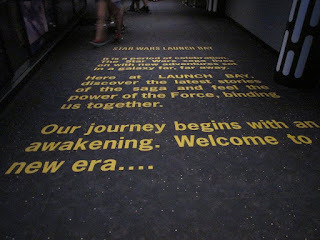 This meant our first attraction was actually the Great Movie Ride. This is an attraction that climbs in wait times later in the day, but everyone is in line for other attractions early on, so we just walked on! I doubt my parents could tell the differences in things, but I noticed the recent changes that were made. Even though I like Robert Osborne of TCM, I wasn't a fan of the audio voiceover taking the place of the cast member. Everything else was fine. The quiet broke up with knowledgeable chuckles, and I was thrilled that I had quickly thought to say that - it was just the perfect time! We visited the planet Jakku, got a message from BB-8, and finished at Coruscant, which I'd never been before! 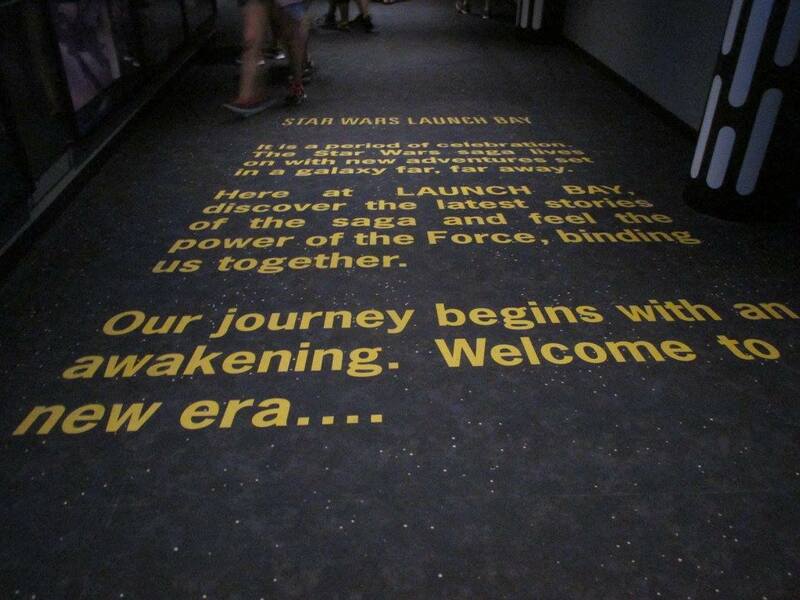 I don't go on Star Tours too often because the motion really gets to me. 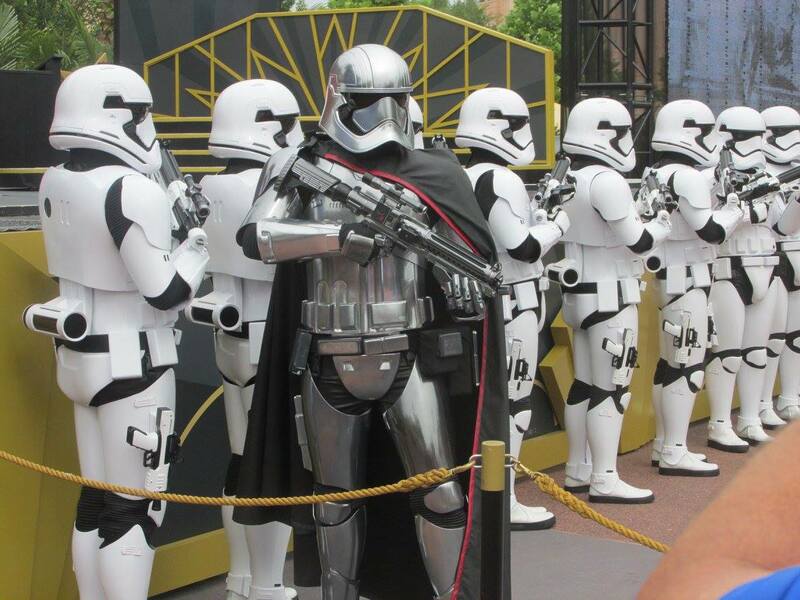 We got back to the center of the park right at 10, and we didn't wait long for the March of the First Order. 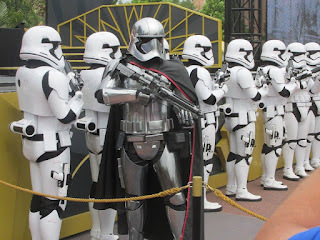 It wasn't really much - Captain Phasma led her First Order troops from the former Animation Academy to the stage in front of the theater, they do some short maneuvers, she says some stuff, and then they march away. I'm glad we didn't wait long and had a good viewing location. It was time for Toy Story Mania, a carnival-like ride where your vehicle takes you to a bunch of different screens and you try to get points using your little pull-string pop gun. I enjoy everything except for getting jerked around going from one area to another (it's not calm!). Mom really got a kick out of it, and wanted to do it again! When we exited the attraction, it had started to rain just a little bit. We put on our ponchos and walked around a bit. We headed down Sunset Boulevard and caught the Beauty and the Beast musical. We were one of the last people in the theater, and ended up sitting in the nosebleeds that aren't even under the covered pavilion! (The rain had stopped, though, so that was good.) Dad really enjoys this show, and it was nice to see it again. It was time for one of my favorite shows: Muppet-Vision 3-D. I was astonished to see how packed the theater was, but encouraged at the same time. 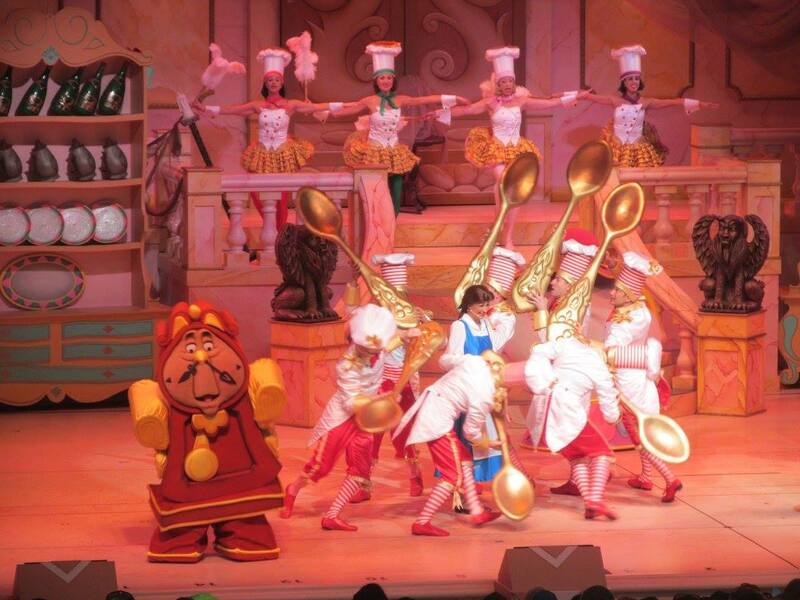 I adore that show, and if people are still packing in to see it, then it probably won't go away any time soon! I can quote quite a bit of that show. Our final FastPass+ reservation had come up for the Tower of Terror, and we all went on it. It was nice not having to wait too much for the ride. When you enter the small library and the TV introduces the Twilight Zone, Dad quoted the whole thing! (Quietly, of course; enough to be adorable.) 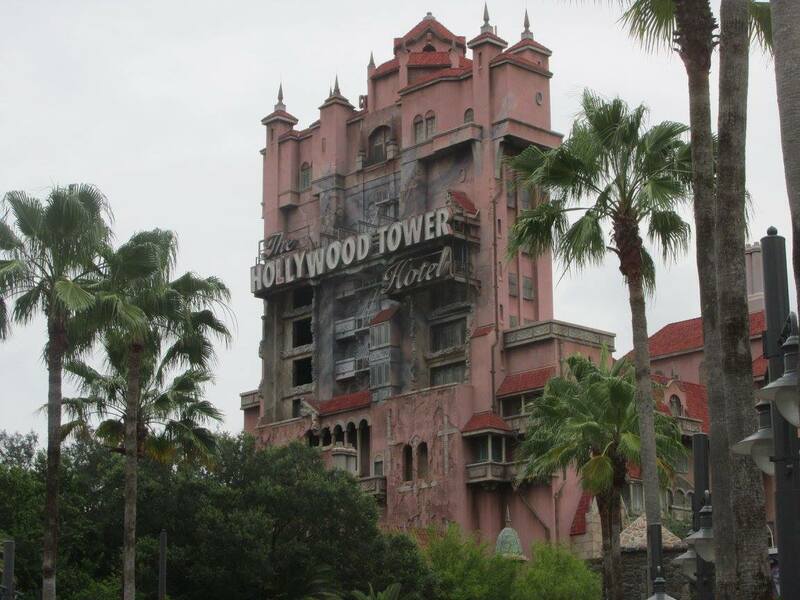 That introduction tells the story of the Tower of Terror, and then you are let out into the service elevators. As we were waiting, a cast member yelled out, "is there a single rider?" Suddenly, Mom says, "Me!" and leaves us! As she headed to the elevator, Dad yelled, "If I never see you again, I love you very much!" Out of all the times I've done this ride, I think this was my favorite time! I enjoy the sensation - it's much easier to tolerate than the motions of Toy Story Mania and Star Tours. It was time for lunch, and we tried Starring Rolls at the exact wrong time. (It's so small!) So we decided to go to the ABC Commissary instead. While it's bigger, we still were there at the wrong time, and waited quite a long time. That was good, though, because it gave us time to choose our food. Mom got the chicken club with green beans, Dad had the angus hamburger with fries, and I got the chicken nuggets with apple slices, and we shared the side dishes amongst each other! As we were eating inside, the clouds suddenly released a torrent of rain! You could see the amount of ponchos suddenly swell in size. 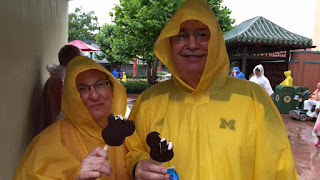 So before we left the Commissary we made sure to put our ponchos on, and for the first time in the vacation, we were glad we did! We walked to the Indiana Jones Epic Stunt Spectacular in a downpour. Unfortunately, because of the rain, the third segment in the stunt show was cancelled, which was a bummer. It's always fun to see the plane explode. But it was still fun. The rain stopped during the show, and I needed to grab a couple of things from the car. I didn't have a strong desire to see the Voyage of the Little Mermaid show, so I told Mom and Dad to catch that without me while I got what we needed. As I walked to the car, I decided to do FaceTime with my little sister! My niece was taking a nap, so we had a nice conversation as I got to the car and walked back to the park. I had an especially nice-looking bag checker, and my sister saw him from the phone, and demanded I go back! 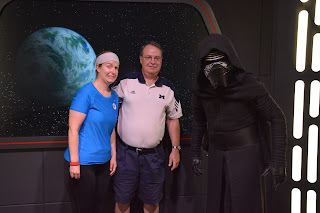 Mom and Dad got to talk to my sister as well as the rain started up again, and then we went to the Star Wars Launch Bay. Unlike Disneyland, they have everyone watch a preview movie before entering the exhibit. I don't think there was quite as much as the Launch Bay in Disneyland, but we did come across some Jawas who were taking pictures without a queue and were very excited when I exclaimed, "Utini!" to them. We decided against waiting in a queue to meet Chewbacca or Kylo Ren, but as we were heading out, I noticed a cast member guarding a small hallway. A lady was there talking to him about "her Chase card," and I realized this was one of those special Chase Visa character meet-and-greets, and I had my Chase card with me! 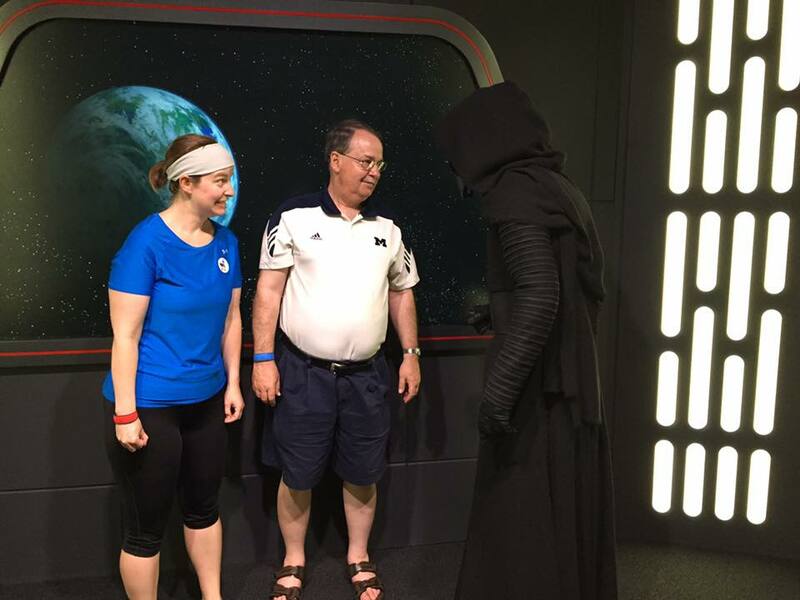 I asked the cast member who was greeting, and he just said, "A representative of the First Order." It piqued my interest, so I showed my card and we were led inside. We were told to wait just around the corner, and we were just standing there waiting, when Kylo Ren suddenly appeared from around the corner, beckoning for us to come with him! It was so cool! 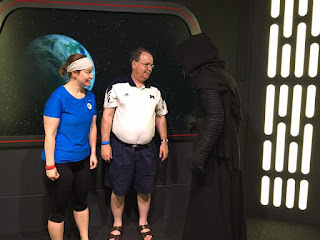 I honestly have no idea what he said, but he encouraged us (in Adam Driver's Kylo Ren voice) to join the First Order and bring down the Resistance at all costs. Mom took my phone and snapped some pictures, and Dad and I got our picture taken by the cast member. It was a free download, which was great. And it all took less than five minutes! 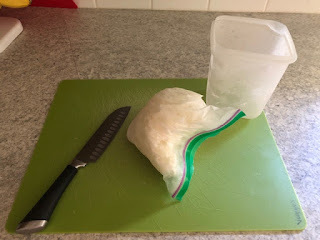 The Frozen Sing-along show was coming up, and we decided to give it a shot. It started to pour again as we waited under cover, thankfully. For a show that probably wasn't on any of our Must-Do lists, the Frozen Sing-along was surprisingly good! 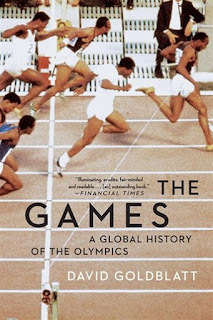 I'd seen it before, but my parents loved the goofy narration provided by the Arandelle "historians." Dad also sat next to a little girl who was entranced by the whole thing and sung along with "Let It Go." (as did most of the girls in the theater). I saved my voice for Olaf's singing of "Summer." I was shocked to hear Dad declare it as his favorite thing of the day! We snagged a snack as it continued to rain - Mom and Dad had Mickey bars and I decided to eat a Mickey ice cream sandwich (sacrilege, I know!). We huddled with some other people under an archway by the Great Movie Ride. Little moments like that are ones I cherish in the long run. We watched the Star Wars: Path of the Jedi movie, which is a good clip show about Luke Skywalker's journey to becoming a Jedi. It was the same one they show in Disneyland, but when I saw it in January, it concluded with the main trailer for The Force Awakens. This time, it summarized the movie instead, including the big moments at the end! I liked how they incorporated it into the movie. I had managed to get an addition FastPass+ reservation for Toy Story Mania because Mom wanted to do it again so badly. I was happy that, after we got through the queue, I could still get a Fantasmic! FastPass+ reservation. I figured that a lot of people would want to catch the only showing of Fantasmic! that night, so I wanted guaranteed seats. 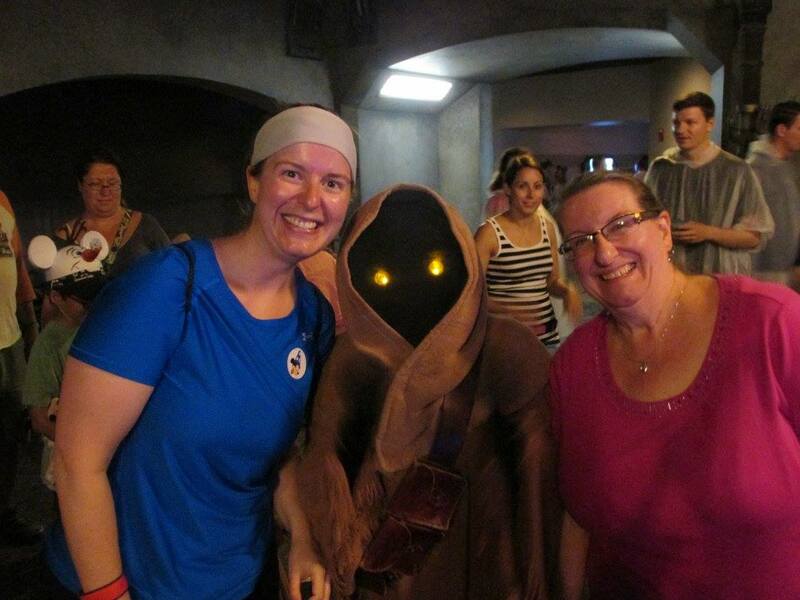 We happened to be crossing the center of the park for the other Star Wars stage show: A Galaxy Far, Far Away. I liked this one because it used the video screens, movie clips, audio, music, and actual characters on stage like Darth Vader, BB-8, C-3PO, Darth Maul, both Imperial and First Order stormtroopers, Boba Fett, and R2-D2. It even ended with a few fireworks! It was supper time, so we walked down Sunset Boulevard and decided to eat at the kiosks across from the Fantasmic! entrance area. Dad and I ate pizza - the pizza kiosk was tucked away in the back, and not many people even knew it was there. There were long lines for other kiosks, but not that one! Dad actually walked around and found a hot dog for Mom. It was comically large! The rain was drizzling, and I still had a small sliver of hope that Fantasmic! would still be happening. 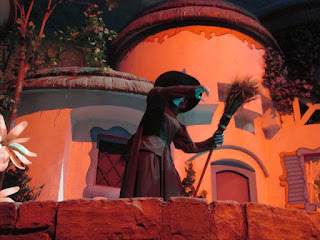 We had covered everything in the park besides the nighttime show, so we weren't in a rush at all. I went down Hollywood Boulevard and picked up some souvenirs for my nieces and a nice Mickey ornament for myself. The rain continued, and Mom and Dad had moved from their table-under-an-umbrella to an overhang by the Tower of Terror. Since we were so close to Rock-n-Roller Coaster, they encouraged me to go for it, since all we were doing was waiting. So I did! I caught the single-rider line, which took a little longer than I anticipated. As I was getting into the ride vehicle, I could hear Dad's phone ringtone, but didn't answer it. It wasn't till after my ride that I checked the voicemail. It wasn't very long: "Sorry, honey, but they canceled Fantasmic!" 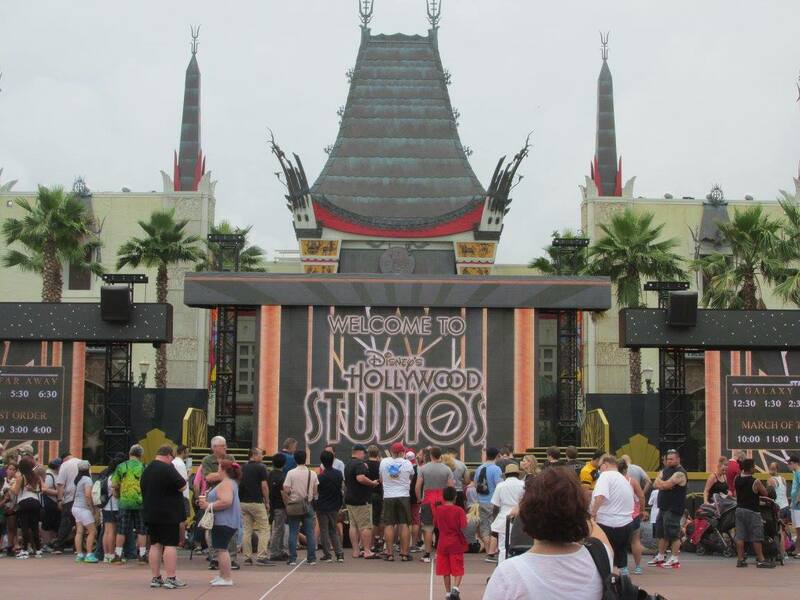 Well, there wasn't any more reason to be in Hollywood Studios, and, to be honest, I don't think any of us anticipated covering as much ground as we did in such wet weather. But we only missed out on one thing - it was a very productive day! We loaded up the car and left Disney property for the last time in the trip. It was a bummer - and I was especially moody because of the cancellation of my favorite show. Luckily, the rain didn't cause too many problems as we drove up I-4 to the Universal resort area. Dad and I checked in at the Cabana Bay resort, where the team member (not cast member!) was incredibly helpful and told us everything we needed to know about transportation to Universal, where our room was and how to get there, where to find the food court, and more. We had to use the team member entrance because Cabana Bay was expanding its buildings and parking lot, but we got there. Cabana Bay is a 1960s-themed hotel, and when you enter the resort, it really feels that way. We were in the Continental building, and the room was very cool looking. They even had Zest soap and VO5 shampoo and cream rinse! Even with all these cool amenities, the resort didn't feel as safe as Disney. We drove past an ambulance for a medical emergency, and there were those blue emergency signal pillars (you know - the ones that area all over college campuses) all over the place. It felt different. But we weren't there to enjoy the resort. I got this resort because I felt my parents would appreciate the nostalgia, but the main reason we were there was because it would provide us with early entry into the Wizarding World of Harry Potter the next day. To make sure we didn't have to wait around for anything, I utilized the park ticket counter because we only had vouchers and not our actual tickets. I went down the first time, but then was informed on the computer that I needed the credit card that was used to get the ticket. So I went back up to the room. (The lobby and the room were not close together, by the way!) Dad couldn't remember which credit card he'd used, so he and I spent a lot of time online trying to figure it out. Eventually I was given a card and hoped that it would work. And it did! Phew. I didn't want to go up another time. Our final park day is here! 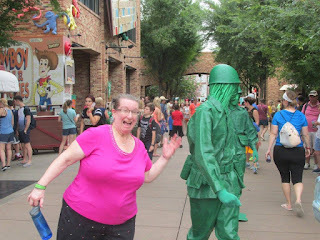 The final vacation post that you can read HERE will cover Harry Potter World er, Universal Studios and Islands of Adventure! Gold (and overall champ for the whole week!!) 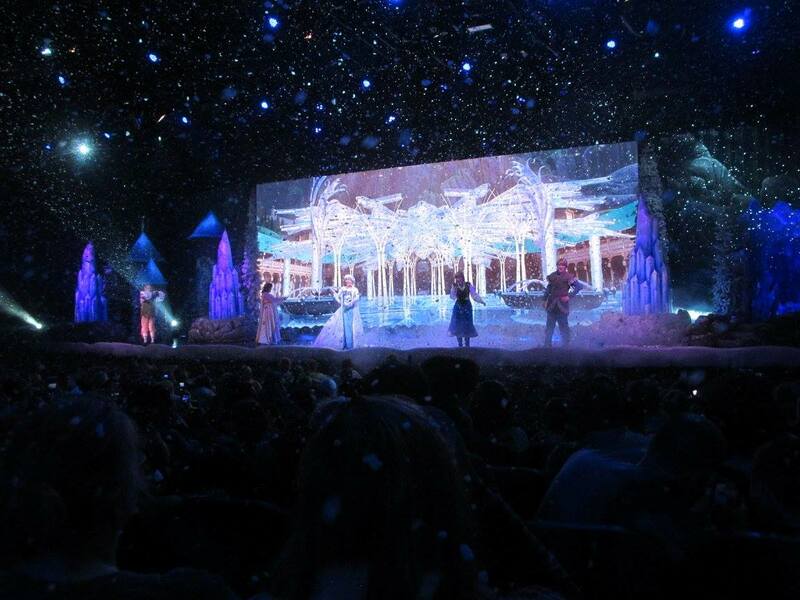 - For the First Time in Forever: A Frozen Sing-along.